Martin Clark, a circuit court judge, lives in Stuart, Virginia. His first novel, The Many Aspects of Mobile Home Living, was a New York Times Notable Book, a selection of the Book-of-the-Month Club, a finalist for the Stephen Crane First Fiction Award, and appeared on several best-seller lists. "An engrossingly realized novel.... Elmore Leonard meets John Grisham, but smart and procedurally realistic with lots of crackling… dialogue and a plot wound as tightly as a watch." 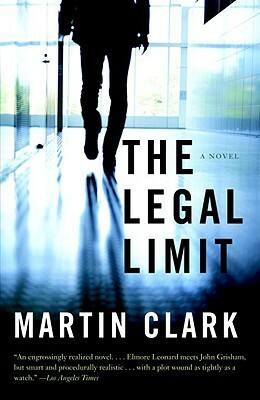 "Funny, smart and Southern to the bone...[The Legal Limit] packs a wallop...it's so intoxicating that it doesn't just dazzle Clark's reviewers, it inspires them." "[The Legal Limit] is filled to the brim with creamy, substantive, compelling prose...the manner in which the intricacies of the law, truth, justice and friendship [are] handled is masterful...This is writing at its best." "Clark conveys the joys of small-town life with an eye for detail and the beauty of worn, familiar things."